a. As of 27 June 2013, we have proofread the entire vocalist book from beginning to end. We were not able to find any more errors, with those two exceptions. b. As of 27 June 2013, those errors have been corrected in the printed books. c. The good news: the Sundays 11-13 do not usually occur, so it might be another decade before they come again. d. As I explain below, please let us know of any errors you find. We have tried to make this easy, using all the texts and free scores on the website. Please do not assume we are infallible: look ahead each week and double check that all is correct. After all, there are many errors in the Lectionary itself, even after forty years!!! e. At this time, please read the original message (BELOW) posted on 23 June 2013. Several errors have been noticed in the Chabanel Vocalist books. I will be working to address this issue, but in the meantime, please consider these reflections (below). Thank you so much for your continued support and prayers! 1. 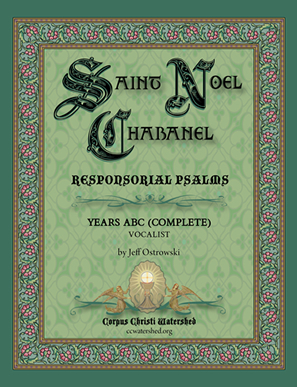 There have been several errors found in the Chabanel Psalms Vocalist Book. 2. I am deeply sorry for these misprints. Even though I was not the only person involved in proofreading the Vocalist book, I take full responsibility for them as Project Leader. 3. We always try to make sure there are no mistakes. We have several rounds of proofing, including a session done by multiple people vocally (together). I honestly don’t know at this point how any errors made their way in, but I suspect it was a technical glitch. 4. Watershed has placed more than 6,000 scores online for free, and I lose a lot of sleep whenever any errors are reported. I take it very seriously and do everything I can to fix errors whenever they are reported. 5. It might be worth remembering that every single book ever published has errors and typos (even going back to the 16th century editions of St. Robert Southwell’s poetry). However, this reality doesn’t keep me from being concerned about errors when discovered. 6. The difference is, since the very first day, we have also provided 100% of the Chabanel scores online, available 24-hours-a-day. No other company does this. 7. Since the very first day, we have always provided the complete text of the Responsorial Psalm right next to the online scores, to minimize the possibility of any mistakes. This was a massive undertaking, but I think it’s important. 8. It is probably worthwhile to remember that the Lectionary itself (in Latin & English) has numerous typos and errors, even after 45 years. Fr. Felix Just has confirmed this statement. 9. Hardbound booklets were only printed because so many people wrote to us, explaining that they didn’t like printing the scores from the internet each week. Our books are offered at an extremely low price. In other words, this was an effort on our part to respond to the needs of people we serve, in spite of our small staff. 10. The easiest thing to do, when an error is found, is to print off the correct vocalist score from the internet and glue it inside the Vocalist book. From what I understand, the next time the erroneous Psalms will occur is 2016. 11. Again, 100% of these scores have been available online since day one. We have always tried to provide numerous options, transpositions, and many alternate harmonizations. We try to provide mp3 files and video recordings we hope are helpful. 12. So many of the books by the major Catholic publishers don’t even use the Lectionary text. They make up versions of their own, instead of using what is printed in the Lectionary. This was actually the reason for the genesis of the Chabanel project back in 2007. 13. Although I am always grieved to hear of any mistakes in our scores, I feel the aforementioned errors should be looked at as “bumps along the way.” In other words, we will continue to offer the best possible services we can, because so many people seem to appreciate our work. However, this does not mean I am not concerned when I hear about errors in any of the 6,000 scores we have currently placed online. 14. Again, thank you for your continued support. And thank you for understanding that we are not perfect, and sometimes errors happen. God bless you and yours.